Symbiotic immunomodulators such as the human hookworm – Necator americanus (NA) and human whipworm – Trichuris Trichiura (TTO), are organisms with which we have formed a mutualistic bond during millions of years of coevolution. Until relatively recently hookworms were found in many parts of the world but, due to modern sewage systems and eradication projects, are now primarily limited to developing countries. It is estimated that 576-740 million people across the globe are infected with hookworms. Symbiotic immunomodulation involves deliberately hosting a controlled number of carefully selected, benign intestine-dwelling helminths such as Necator americanus (NA) and Trichuris Trichiura (TTO). The introduction of NA hookworm requires the larvae to be placed onto the skin, which they normally penetrate within 10 – 20 minutes. They are then carried through the blood vessels to the lungs where they ascend the bronchial tree to the pharynx, and are swallowed and eventually reach the small intestine where they reside and mature into adults. Adult worms live in the lumen of the small intestine, where they attach to the intestinal wall and normally remain alive for 3 – 5 years. It is often necessary to have at least 3 doses of NA hookworm larvae at a minimum of 12 week intervals to get optimum results. The life cycle of Trichuris Trichiura – commonly known as whipworm due to their whiplike structure— relies on the eggs being passed in stool and under the right circumstances becoming embryonated before becoming infective. Once the embryonated eggs are consumed by a human host, they hatch in the small intestine, stimulated by exposure to microflora in the gut. The juvenile worms then enter the crypts of Lieberkuhn, a gland found in the epithelium lining of the intestines, where they grow and molt 4 times before making their way to the large intestine. It is thought that whipworm first colonise the cecum area (beginning of the large intestine) and with further exposure the worms make their way down the colon. It takes around 3 months for the worms to fully mature and for the females to begin to lay eggs. Suppression of inflammation by helminths: a role for the gut microbiota? Essentially, helminth symbionts modulate the human immune system in subtle yet complex ways, ‘regulating’ or ‘balancing’ overactive immune responses associated with allergic, inflammatory and autoimmune disorders. What illnesses can the treatment help with? Crohn’s Disease, Allergies, Asthma, Colitis, Coeliac Disease, Psoriasis, Eczema, Food intolerance, Multiple Chemical Sensitivity, Multiple Sclerosis , Eosinophilic Esophagitis, Rheumatoid Arthritis..
For more information see the success stories document. Possibly, but there is no way to know for certain. It is claimed that as many as 80% of people who trial this treatment see an improvement in symptoms but not everyone will necessarily benefit from the introduction of helminth symbionts. In a very small minority of cases it can take up to 2 years to see the benefits, and it may still be necessary to look at diet, exercise, mental health, stress levels etc., to attain optimum results. Who shouldn’t use this treatment? Under no circumstances should anyone with a serious, life-threatening infection such as HIV embark on this treatment and, similarly, anyone with a history of cancer or blood clotting disorders will, in all but the most benign of cases, be precluded from proceeding. Women who are planning on becoming pregnant in the near future need to weigh up the possible pros and cons in discussion with their medical professional. However, due to the lack of clinical data, anyone who is pregnant would need to wait until after the child is born before beginning the treatment. Anyone with a history of anaemia should have their iron levels checked and, if necessary, get these into the normal range using supplements or dietary modification before commencing. If you have a history of intestinal strictures or bowel blockages, or you are currently experiencing symptoms associated with intestinal scarring due to IBD, please contact us to discuss further as the introduction of NA can, in the short term, lead to the exacerbation of these symptoms. According to the CDC, most people infected with hookworm/whipworm have no symptoms though it is possible for anaemia to be an issue if someone has a very large number of worms present in their intestines. However, this is highly unlikely with the dose sizes we use. Furthermore, neither organism can proliferate in the body so the infections can never run out of control; the total number of worms you will have residing in your intestines at any point in time will never exceed the sum of the doses you have applied. If for any reason you decide to kill off your symbionts you can do so relatively easily with a course of albendazole. If the treatment works will I be cured? Probably not. At this stage there is not much evidence to suggest that symbiotic immunomodulation can cure anyone of their illness. Even if you do find complete remission from your symptoms, you would need to maintain an active colony of NA and/or TTO to remain symptom free. Can I pass the symbionts on to anyone? As long as you use proper toilet facilities there is no risk of either passing them to anyone else or self infecting with more worms. To become infective, hookworm eggs must leave the body (passed in faeces). Under optimum conditions the eggs then hatch and the larvae grow in the soil, molting twice before being able to infect a person whose skin comes in contact with the larvae. Similarly, whipworm eggs are only infective after they become embryonated, under the right conditions, outside the body. Can my doctor prescribe this treatment? Perhaps, but most likely they would only do so ‘off the record’. As doctors are usually bound by the rules of the regulatory bodies such as the FDA, MHRA, TGA and the EMA, they are often limited in what they are allowed to prescribe. However many doctors are sympathetic to their patients’ hope of finding long term health via this safe alternative and will continue to monitor them while on the treatment. Can I talk to a doctor at Symmbio? No, we are not doctors and nothing on this site or in our literature or communications with you should be taken as medical advice. We strongly recommend that you find a medical professional who will continue to provide you with whatever medical care you might require while you are using the treatment. We are also happy to communicate with your medical professional if they wish. What size dose should I have, how many will doses will I need and how often? Since each individual is different, there can be no one-size-fits-all approach to the use of helminths, diets or many other health-related intervention. However there are certain indicators, and we can help you make an informed decision. Certain illnesses may require regular large doses throughout the treatment where others may require only a few small doses. For more information please see the Hookworm Dosing and Response document which can also be found in the files section of either the Helminthic Therapy Support group on Facebook or the Yahoo Helminthic Therapy forum. *Maximum of 3000 ova in a 2 year period. Currently, payment can only be accepted in Bitcoin but we hope to offer other payment methods in the future. For help getting started using Bitcoin, see our Beginner Bitcoin Guide. We ship to almost anywhere in the world. Please contact us for up-to-date shipping policies and guidelines. NA larvae are quite susceptible to extreme temperatures so, depending on where you live, and especially in the coldest/hottest months of the year, you may need to ensure that your package arrives to a temperature controlled, indoor mailbox or P.O. Box. TTO are less susceptible to extreme temperatures and will in almost all cases be viable on receipt. If you have any concerns about your shipment please contact us. Depending on where you live, shipments should normally arrive within 4 – 18 days of being sent. If your NA dose has not arrived within 21 days of being shipped, we will send a replacement dose free of charge. Can I store hookworm larvae to use later? To give the best chance of receiving a viable dose, NA larvae should be applied as soon as possible after arriving and, if necessary, stored in the package at room temperature and never be placed in the fridge or left in a hot car or in direct sunlight. Once packaged and shipped, the symbionts will normally remain viable for only 3 – 4 weeks before beginning to die off. What happens if the NA larvae are not viable on application? Most people will normally notice at least a slight itch and rash on their skin after applying the larvae, however, this is not always the case. Please contact us if you are concerned the larvae have not made it intact and we will help you to decide on the best course of action. As it is possible, with the first dose especially, to have no itch or rash even though the larvae have penetrated the skin, it is essential that you wait at least 3 weeks before having a replacement dose. It is very important to make sure you don’t double up on doses as it can lead to extremely strong side effects. Some new hosts have reported having very noticeable intestinal side effects in the weeks after applying their dose, even though they did not have any reaction on their skin. In cases where it is agreed that the dose was not viable we will reship to you free of charge. Similarly, if the dose has not arrived within 21 days of being shipped, we will send a replacement dose free of charge. Though some people will see benefits quite soon after beginning the treatment, it is not usually fast acting and any benefits that appear in the 3 months following the first inoculation may not be consistent. The majority of people will see the most improvement after roughly 6 – 9 months and after adding a few supplementary doses at a minimum of 12 week intervals for NA or regular doses of TTO. There have been cases of some people only seeing benefits after 18 months and many hosts have found their health continue to improve, years after starting the treatment. How long do the symbionts live? Usually NA live for 3-5 years however there is strong evidence to suggest that some people’s immune systems are much more aggressive towards NA, in which case they can be killed much more quickly. T. Trichiura live for 1 – 2 years though there are some reports that suggest they can live for much longer. Again however, intestinal inflammation can lead to whipworm dying off quicker for some hosts. In most cases, with the dose sizes we use, there is not much chance of experiencing any strong side effects. However, anyone with a chronic infection such as Lyme, Hepatitis or Herpes etc., may see an initial exacerbation of their symptoms due to the immunomodulatory effect of helminth symbionts. Some side effects may be noticed, especially following the first dose. These may include intestinal discomfort, diarrhoea, flu like symptoms, fatigue, fever, joint-pain and the possible short-term exacerbation of existing inflammatory symptoms, but all these symptoms are invariably short lived. With each dose, there can be mild to severe itching and a rash at the entry site. This can be quite irritating for some people, however there are ways to reduce the severity, and the itching and rash mostly passes within days of applying the dose, even without intervention. If you have any concerns about this please contact us and we can discuss options regarding limiting and/or treating possible side effects. For more information see Treating a Hookworm Inoculation Rash. 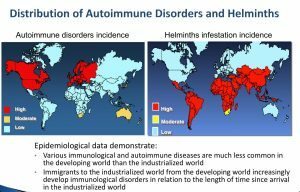 What percentage of people have seen benefits from helminth symbionts? It is hard to find exact numbers as most people are self treating experimentally. However the accepted percentage is between 65-80%. Are there any substances I need to avoid while on the treatment? Yes, a few. Nitrous oxide (N2O), for example, is known to kill NA, even in the small amounts from whipped cream so N20 should be avoided completely. Antibiotics may kill the larvae, but, in most cases they will only stop them working for up to 8 weeks. We encourage everyone (not just symbiont hosts) to try to find alternatives to antibiotics where possible. T. Trichiura are less likely to be affected due to the way they feed and attach to the colonic mucosa. Some forms of certain natural substances that are known to be antibacterial or antihelminthic (e.g. some concentrated herbal tinctures or extracts) may also affect the worms as would any known antihelminthic medication. For a comprehensive list of substances that may affect NA larvae, please see the Human Helminth Care Manual.